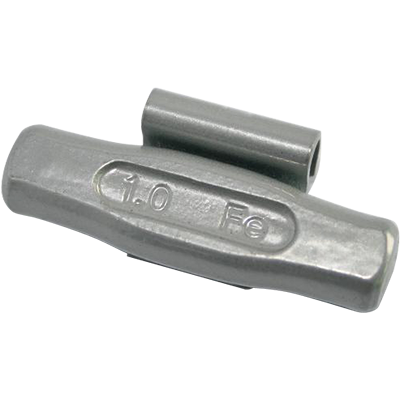 Ranger offers a complete line of environmentally conscious steel weights for almost any application. 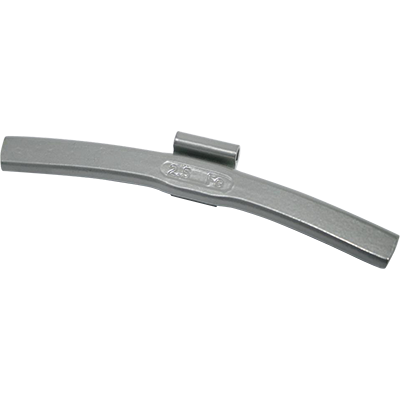 Whether your wheel balancing needs are focused on passenger cars or heavy-duty trucks, Ranger has the right wheel weights for your needs, in stock and ready for immediate delivery. The nation's ongoing movement and legislation to ban the use of lead weights is a widening trend, based on increasing studies illustrating the impact that lead wheel weights have on our environment. As partners in the EPA's National Lead Free Wheel Weight Initiative, most automakers are phasing out lead wheel weights entirely, as are major retailers. Many government agencies, such as the U.S. 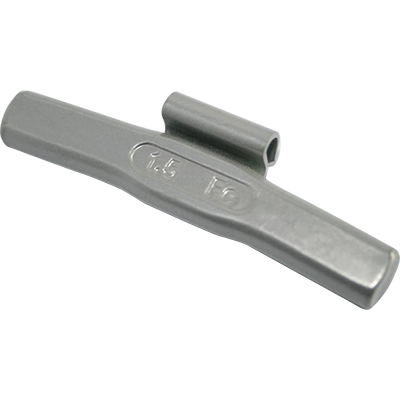 Postal Service and Air Force, have already phased out lead wheel weights within their stocks and vehicle fleets. 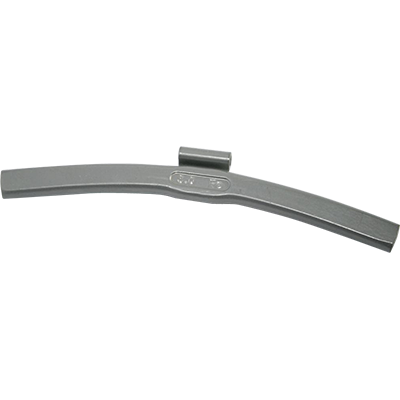 Steel wheel weights are the preferred alternative due to their comparatively low toxicity and fewer environmental impacts from manufacturing. Starting at $63 + FREE SHIPPING! 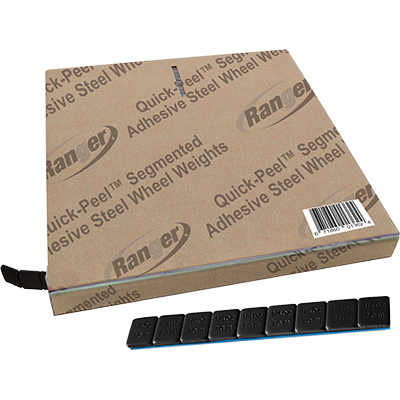 These black Quick-Peel™ adhesive steel wheel weights are an effective and environmentally friendly way to quickly balance wheels using as little weight as possible. 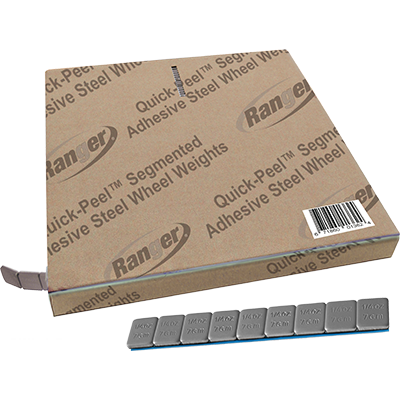 This combo Quick-Peel™ adhesive steel wheel weights are an effective and environmentally friendly way to quickly balance wheels using as little weight as possible. Starting at $122 + FREE SHIPPING! 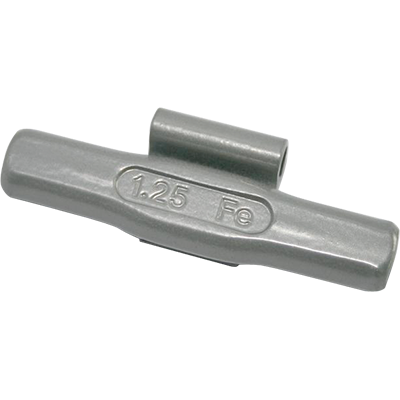 Clip-on steel wheel weights by Ranger weigh .25 oz. to 3 oz. 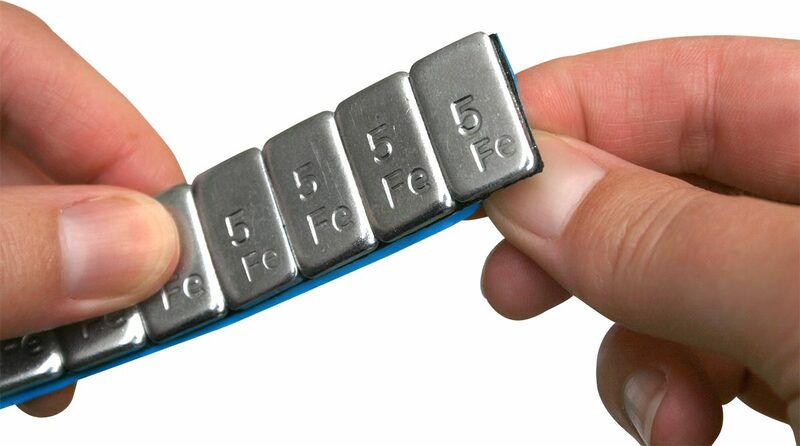 each, increasing in ¼ oz. increments. 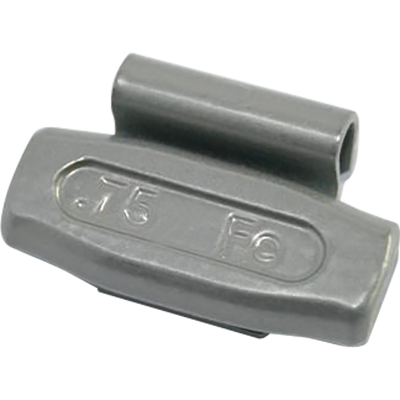 These weights can be fit to virtually any wheel type for every conceivable wheel balancing application. Starting at $15 + FREE SHIPPING! Starting at $18 + FREE SHIPPING! Starting at $22 + FREE SHIPPING! Starting at $26 + FREE SHIPPING! Starting at $30 + FREE SHIPPING! Starting at $33 + FREE SHIPPING! Starting at $38 + FREE SHIPPING! Starting at $40 + FREE SHIPPING! Starting at $45 + FREE SHIPPING! Starting at $50 + FREE SHIPPING! Starting at $54 + FREE SHIPPING! 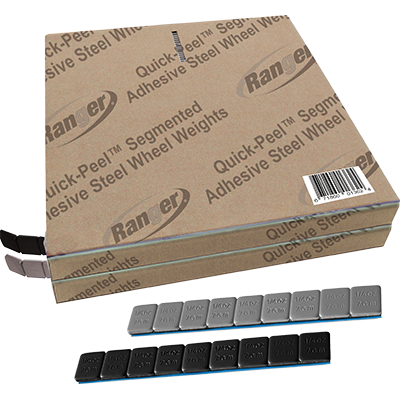 Ranger now offers our popular Quick-Peel™ adhesive tape weights in bulk rolls. They're packaged in self-dispensing cartons, featuring a Free-Glide™ center hub and nylon feeder mouth for smooth, jam-free delivery. Ranger wheel weight spools deliver the exact weight you need without waste. An easy-to-remove Quick-Peel™ adhesive liner minimizes unproductive fumbling and readies weights for quick mounting in fractions of a second. 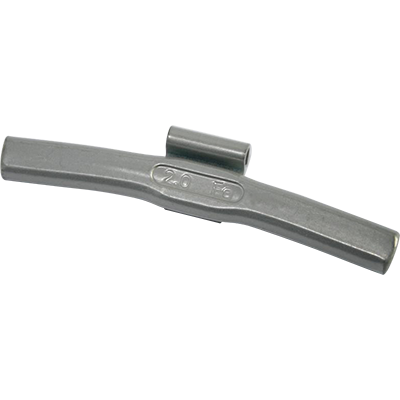 Available in silver, black or combo rolls, Ranger wheel weights are a shop favorite. 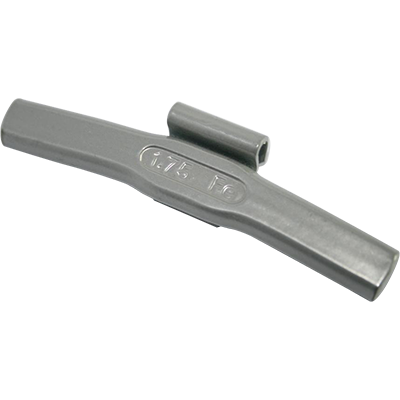 They're easy to install, hold better and are environmentally friendly. 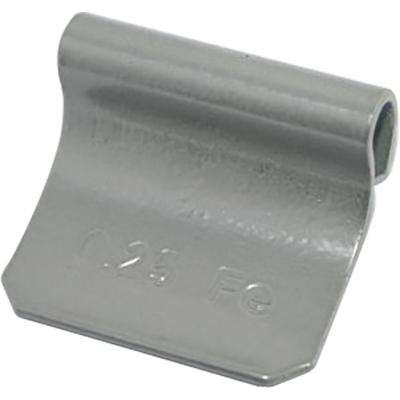 Steel wheel weights are the preferred lead alternative due to their comparatively low toxicity and fewer environmental impacts from manufacturing. Lower environmental and human health impacts, coupled with the high opportunity for steel wheel weights to be made from recycled material, make steel wheel weights the best overall alternative. Eliminating lead altogether is a significant step toward reducing how much lead gets released into the environment; it's common for wheel weights to fall off vehicle wheels over time, which results in environmental lead contamination. Wheel weights that contain lead further harm the environment as they move into the waste stream at the end of their product life.